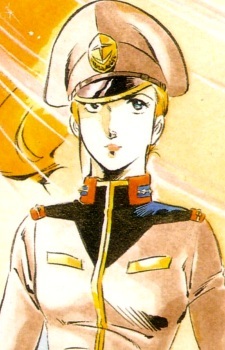 Matilda Ajan is the commanding officer of the Earth Federation's Medea supply corps. At times Matilda also serves as a personal envoy for General Revil, carrying messages and orders from him to other ships. When the White Base is trapped in Zeon-controlled airspace over North America it is the vital supplies delivered by the Medea supply corps which allowed the beleaguered assault carrier to make desperately needed repairs and escape over the Pacific Ocean. Due to her habits of showing up when the White Base is in a bind and helping them in whatever way she can, Miss Matilda has been looked to as the guardian angel of the vessel. Also due to her stunning beauty she becomes the dream girl of many of the young male crew members staffing the White Base, especially the young Amuro Ray. Miss Matilda is engaged to Lieutenant Woody Malden, who was a chief military engineer stationed in the Earth Federation headquarters of Jaburo. When the ship reached Asia, Miss Matilda gave the White Base orders to head to Ukraine to take part in Operation Odessa, a large-scale military operation to wrest control of the mining facilities at Odessa away from the Principality of Zeon.